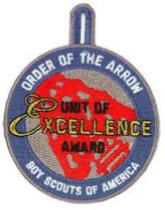 The Unit of Excellence Award was created in 2012 to recognize Units who have a high degree of participation in the OA program. There are 5 categories to the Award; and Units who want to be recognized with this Award must complete requirements in all 5 -- Leadership, Planning, Conversion, Elections and Participation. At any time throughout the year, you may request a report that details your Unit’s participation and conversion (Brotherhood) activities in the OA. To request a report, send an email to LodgeAdviser@nentico.org. This will help you gauge if your Unit is on track. The report lists number of members in good standing (dues paid), participation for those individuals and unit percentage participation, and Brotherhood conversion percentages. After the September Fellowship weekend of each year, units who think they qualify for the award should contact the Lodge Adviser at LodgeAdviser@nentico.org. The Adviser will verify that the award criteria has been met. 2) Certificate for Scoutmasters of Excellence – A Scoutmaster whose unit has achieved Unit of Excellence status three times will be recognized at the annual lodge banquet* with a certificate. 3) Recognition Patch for OA Troop Representatives and OA Troop Rep Advisers – patches can be purchased by those individuals who qualify. *If the troop is not represented at the Lodge Banquet, other arrangements for recognition can be made. If you have any questions about the award, do not hesitate to contact the Lodge Adviser at LodgeAdviser@nentico.org.